Welcome to Veritas tapas & wine, Tehachapi’s first wine bar and lounge. The OzBar is a wine dispensing system that allows open wines to be kept at ideal temperatures (both reds & whites) and under a closed airtight system. This allows the wine to maintain its integrity for a much longer period of time than just an open bottle pour that most wineries and wine bars utilize. As a result people enjoy the highest quality of a particular wine - taste after taste. Our system allows us to maintain a total of 20 wines (12 reds & 8 whites) under those optimal conditions at all times. 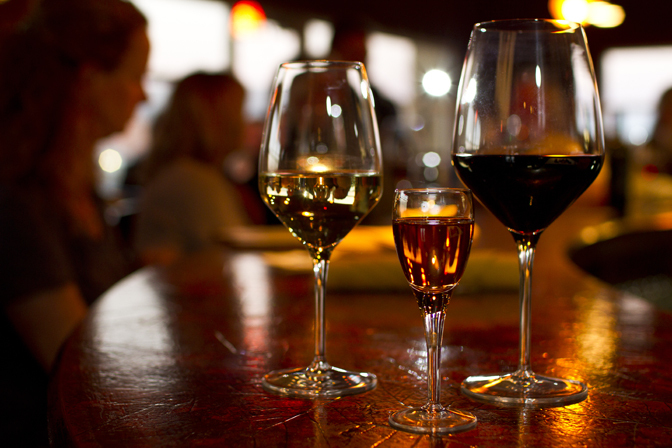 At Veritas tapas & wine bar, you have the unique opportunity of tasting many wine varietals from different wine growing regions of the world. We rotate our OzBar weekly, allowing you to adventure into some of the great wines you would never have the opportunity to otherwise experience. We have hundreds of wine selections in our inventory that have been hand selected for superb quality and value. The inventory will always change because all wines have production limitations. Some wines may have produced as little as 50 cases and will be sold out and replaced by another selection within a few days.